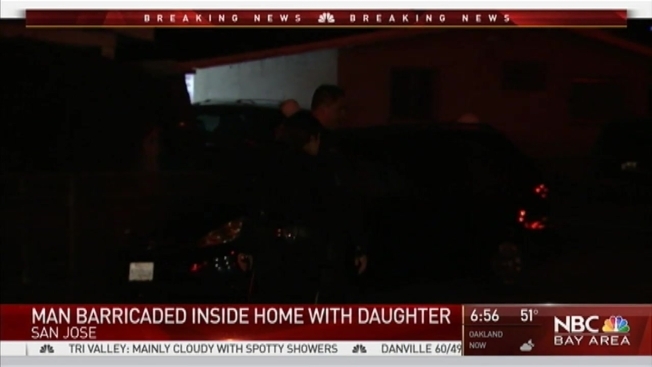 A standoff with an armed father and his 6-year-old daughter in San Jose ended without harm on Tuesday morning, about five hours after the man holed up inside his home with a gun, police said. Police said the father exited the home about 7 a.m. and his daughter came out safely as well. That news capped a high-drama morning in an East San Jose neighborhood, where neighbors were evacuated and the department's MERGE unit surrounded the home, according to Officer Albert Morales. Morales said that he had hoped the father would surrender and that they never considered the daughter a hostage. The original call came in at 1:43 a.m. in the 3200 block of Arthur Avenue on a report of a family disturbance.